I wanted to share something pretty cool with you that I recently shared with my team from the headquarters. A while back, believe it or not, at 5:45 AM, all the team members from our headquarters came out to my house. We had a good time learning about some stuff that I want to teach you. See, I believe in always helping the people who are in our circle of influence. I don’t just want to help my clients and customers. I don’t just want to help my family. I want to help my team members, my staff, so that they can better themselves and, of course, go out and pay it forward. Now you might not know this, but I’m a big fan of deconstructing things. Often times, what we all want from life is happiness, right? You would probably agree that we all want happiness from life, whether you want to lose weight, you want to make more money, you want to start a fitness business, or you get into a relationship. Well then, what exactly does happiness consist of? I started to deconstruct what most people would define as happiness, and I think you might agree with me that it starts off with having good health. We definitely want great health. You also want to have meaning in your life, right? I mean, nobody wants to just go out there and make money without any meaning or purpose. Without meaning and significance, life can be very shallow and numb. Of course, that other thing that I just said is money. Money doesn’t automatically make you happy, but it does relieve financial stress and allows you to spend on things that will make you happy. Even if we have health, meaning, and money, there’s a fourth component missing. This fourth and final key to happiness that I’ve discovered through my personal experiences is relationships—relationships with your friends, with your loved ones, and with family. See, there’s something that leads to happiness: action. If I take all the right actions in my life, don’t you agree that I would be happy? If I take all the right actions in my life, wouldn’t I have more meaning, greater health, better relationships, and make more money? Just like if you take all the wrong actions in your life, you will lose significance, you will lose your health, you will have no money, and of course, your relationships will suffer. Actions lead to happiness. Now it’s a matter of what type of actions do I take, and how can I make sure that the actions I’m taking are favorable? Well, what controls your actions? As far as I know, there’s only one specific answer: your beliefs. Your beliefs dictate your actions, and your actions dictate your happiness (or the lack thereof). Well then, what influences belief systems? Well, from what I’ve learned from Dan Sullivan, it’s two things: the thoughts that occupy your mind and the people that you surround yourself with. You can influence the thoughts that occupy your mind and choose the people that you surround yourself with. For the last nine years, I’ve had no working television in my house. We download stuff from Netflix, Amazon, and Hulu to our television, but we’re not connected to satellite. I don’t want to hear the talking heads telling me how negative life is. I don’t want to hear how bad the economy is or how horrible the election process went. I don’t want to hear about the murders, deaths, and robberies that are taking place. You’ll be happy as long as you can control the thoughts that come into your head and the people that you surround yourself with. If you have negative people in your life, you have people that are crabs. You have people that are time and energy vampires. They are haters. They tell you that you can’t make it, that you’re not qualified, that you’re not old enough, that you don’t have enough money, or that you don’t have enough intelligence. Get rid of those people from your life. Change the thoughts that enter your head, and your belief system will change. When your belief system changes to one of optimism, you have a can-do attitude, and you become a person of action–and of the right action. Then, all of a sudden, you realize very quickly that you are making massive monumental strides in your meaning, in your health, in your relationships, and in your money. Your belief system will impact your actions and, of course, your actions are a direct by-product of happiness or feeling broke and living a sad and unfortunate life. I hope this gave you some idea of what you need to do next in your life. It might be a tough thing, but you might have to sit down and figure out who the people are that you need to get rid from your life, or at least edit the relationship out of your life. 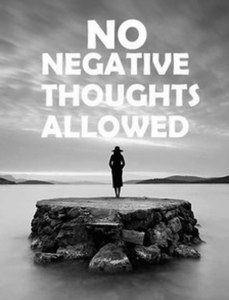 Figure out what thoughts are entering your mind that are leading you to a belief system of negativity. How can you change that mentality around to stay positive and live happy?